Depending on the use of your Grid Pad device, the battery life (from fully charged to 2-5%) will vary. Intensive use including having multiple complex applications open, using Bluetooth, streaming video and listening to music will drain the battery faster than more conservative usage. You can find out how we estimate our battery life here. Below are some tips to get the most out of your devices battery and conserve battery life. The screen is one of the biggest drain of battery on any mobile device, using 50% – 70% brightness is our recommendation. 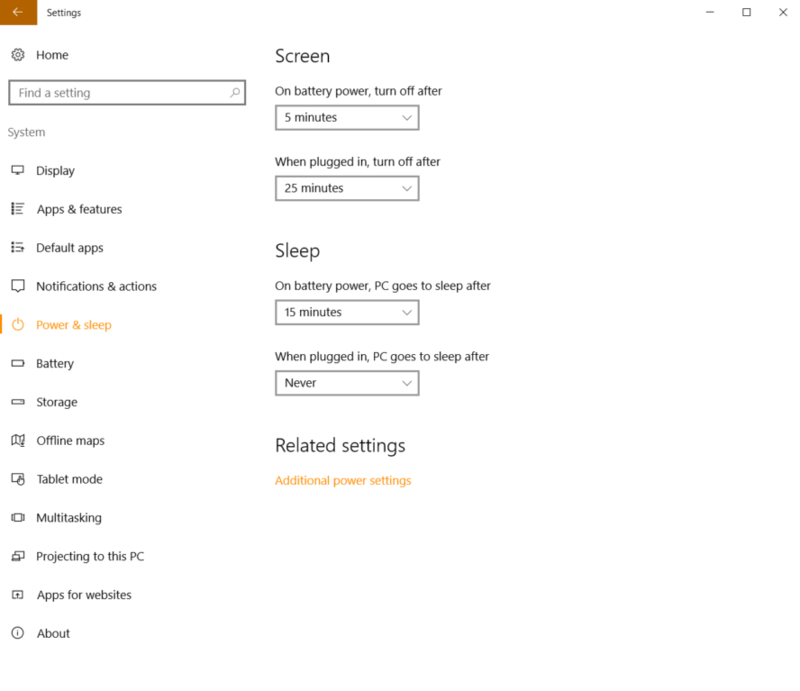 On the Power & sleep screen you can also adjust when the screen will turn off and when the device will enter sleep mode. Turning off the screen more regularly will improve your batteries life span. A good rule of thumb with mobile devices and connectivity is to switch off what you are not using. This includes Bluetooth and Wi-fi. Services like OneDrive and Dropbox keep your devices network and services running in the background. Reducing the frequency of syncing can help improve battery life. Keeping multiple applications open at the same time can have an impact on your battery life. It is good practice to close applications you are not using. If you have a device with an eye gaze camera, the camera software has power options. If you are using a myGaze camera ensure you are using Eye Mouse version 1.6 and above which has an automatic power save mode. Alea users can turn on Power Saving Mode by opening Intelligaze – Service and selecting Power Saving in the speed settings. Our Grid Pad devices use lithium ion batteries. These are found in nearly every current mobile device including phones, smart watches and laptops. Lithium ion batteries will degrade over time but this can be minimised by charging batteries using the tips below. Cycling is the process of charging to full capacity and then using up the charge. When our devices are plugged in they will cycle between 100% and 90% capacity to reduce degradation. It is good practice to fully cycle the battery every 3 months. A full cycle is taking a fully charged battery from 100% to 2-5% (when the device will automatically shut down). It is not recommend to allow the battery to keep reducing to 2-5% on a regular basis as this will degrade the battery faster. If you are concerned about your battery life please contact your supplier. You can can also create a report showing how your battery is performing over time to help diagnose any issues. If your devices battery is not performing can expected get in touch with us, we can help you implement battery saving measures and help you read the Battery report to identify issues.